Beware of creating your worst enemy. All Joe Colsco wanted out of life was a reasonably interesting job supporting a quiet, comfortable suburban lifestyle, eventually a small family, and time to pursue hobbies. Instead, a freak accident casts him naked onto a beach of another planet inhabited by humans with technology circa 1700. 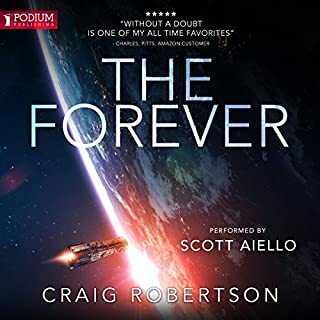 In time, Joe, now known as Yozef Kolsko, makes the difficult acceptance of a new life, has a respectable position in his new society, and is married with a child on the way. But all is not rosy. He has become embroiled in a struggle beyond any dream he could have had - or any nightmare. The Narthani are a militant society intent on subjugating the Caedelli, the people he's come to identify with. Despite Yozef's hope to focus his life on transferring scientific knowledge and supporting a quiet life, he finds his life's direction moving beyond his control. As his actions and ideas become more important in resisting the Narthani, he reluctantly finds himself dragged into leadership roles he doesn't believe himself qualified - including efforts to unite the Caedelli clans. The transformation of Joseph Colsco to Yozef Kolsko is about to take another step. Unwittingly, the Narthani themselves are creating an opponent unlike any they have ever faced, an enemy beyond their conceptions. I am hooked on this series, but disappointed with Book 3. 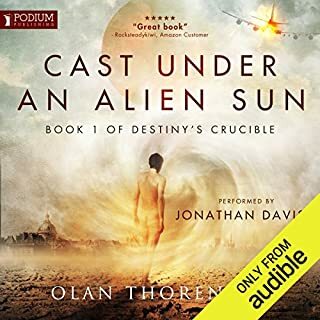 Olan's excellent writing style continued, but the balance between action and backstory was heavily skewed towards the latter. On the plus side, a bit more of the SciFi storyline came through. But, they were just snippets compared to the over-indulgent details that dragged down the overall storyline. I do want to point out that Jonathan Davis' narration really helps to make these books great. There are so many characters that it would be impossible to keep them all straight without his incredible diverse range of vocalizations. So I am definitely in for the 4th book as the overall series is fantastic. My hope is that it lives up to the promise of the first two. I enjoy this series very much. The story and character development is excellent. I especially enjoy the way that the narrator brings each and every character to life.There are so many possible directions that the story can take and I anxious to hear the next book in the series. This series of books are awesome! I could not stop listening to the great performance Jonathan Davis provided. 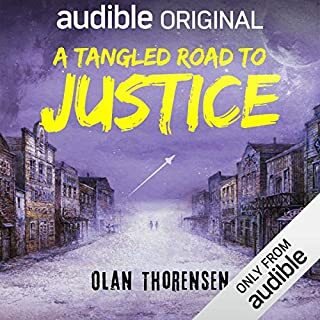 Olan Thorensen’s writing was truly fabulous! I strongly recommend these books. Jonathan Davis has a great character range, not forced, doesn't detract from the listen. Its generally a very interesting and fun concept. Anyar got Kolsko, Earth got DaVinci? Awaiting the next in the series. OK I have to admit I am totally hooked on this series, and this performance. It is clearly not for everyone, and it has been swerving into the &quot; Game of Thrones&quot; arena on more than one occasion. That said, the characters are so real, and the vision of the planet is so compelling, that I find myself looking forward to the next offering . This author knows how to write, bringing to the table a lot of his own knowledge, and weaving it into a completely immersive world. I really enjoyed this and the last two stories, and each inspired me to learn more about Joseph's insights by reading books he actually references in the story. Can't recommend this book more and the series as a whole is worth an investment. I can't say there are many books I'd read (listen) to again but this is one. I'd re listen to the whole series just to get more. By the way narrator 10 out of 10. 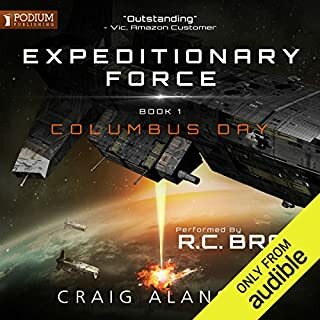 I listen to a lot of audiobooks, and this is my favorite for the year (2017) so far. In fact, the series (Destiny's Crucible) is in my top 5 all-time. My other favorites are Lord of the Rings (you might have heard of it), the Foundation Series (Asimov), the Vorkosian Series (Lois McMaster Bujold) and the Lost Fleet (Jack Campbell aka John G. Henry). So that is the kind of company this series is in, at least in my view. It is similar in setting to Weber's Safehold series, but better. Someone from the present ends up in an early modern modern society (similar to Europe circa 1700) and tries to help the locals make scientific and industrial progress. He lands on an island about the size of Great Britain and gets caught up trying to help the Islanders fight off invaders from one of the large continents. One thing I like is the balance of action and character development. There are quiet lulls in the book where things move slowly instead of just being a roller coaster ride from one battle to another. The characters are excellent. There is even good character development for the main characters on the other side. And both sides have their share of admirable and not so admirable characters. Also, the storyline has a mostly positive arc. Yes, the protagonist has some reverses and nothing is easy but, in general, the storyline is about progress. And it is not just technological and military progress. Political and economic development also play an important role in the series. Great book, the best of the series so far (although all are very good). And the performance is excellent. This entire series is such a great concept and spans genres in a way that you're fully immersed in one, jump to another and back again. It's truly mind expanding! 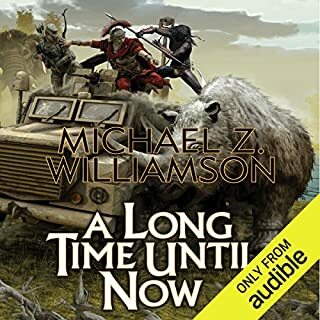 Excellent narration with very developed personalities and voices add a lot to the story, so much so that I'm not sure I could pinpoint his normal voice. Can't get enough of this series. So good! We see a definite transformation occuring with Yozef in book 3 as he begins to accept more responsibility and discover a leadership within himself he never knew was there. However, all the things I love about the series, introducing new modern day era innovations and creating battlefield tactics that baffle enemies are still present in full force. I could listen to 30 books in this series and hope they keep coming. Thus far, books 1-3 were finished in just one week as I could not put this series down! Too much talking, but no action! Mm, this book really made me think about the whole series as a whole. There were so many great moments etc discussing tactics and plans but not a lot actually performing the deed. I find it, especially frustrating to read some bits of the story, where they sounded rearing to go to battle around chapter 15 but actually "battled" around chapter 34!! As you can imagine, it irked me to no end! I really wanted Jose to be featured more dominantly in some of the poorly written action, rather than appearing as sullenly wallpaper character! The whole story drag on and on, it has none of the excitement of the second one nor the first installment. At one point, I had to keep pressing the 30sc every now and than. The first half was good, but it disintegrated around the second part. The sense that I get funny enough, was that it was all bark but no bite. I won't be looking forward to read nor listen the last instalment, it has gotten quite too boring for me and I can predict the action will only happened on the last few chapters just like this one sigh. The premise of the overall story is good. It ought to of been a trilogy at most. Unfortunately it has descended into a padded out multi book milking of the authors readers. The writing hasn't particularly improved since book one either and carries with it a distinctly amateur feel. Disappointed, I will not be bothering with further books in this series and probably won't bother with the author again. The book has a good underlying concept but is seriously let down by continuous recapping of past events plus inclusion of a vast amount of meaningless padding that does nothing to move the story on. This is one to avoid as the story stalls time and time again with the inclusion of repetitive pointless non story elements. Did I mention the repetition? just incase I found the repetition at times unbearable. Im not sure if I mentioned the endless padding, by the way Im just off to boil some eggs for breakfast, then I have to meet my wife later on this morning.....but the padding! I think I might have some toast with those eggs. Did i say I have my son staying with me?....All in all 2 hours of story and nineteen hours of repetition and padding.....did I mentioning the repetition and padding? If not it was padded out and very repetitive. mmmm just off for those eggs. I know there are better books out there but I must confess I am addicted the blend of SF, Fantasy and Historical Fiction. Wonderful. Summary: Repetition of insignificant facts ad nauseam, exposition through dialogue like a children's book, still, there's a hook there. 10% of the book is good. 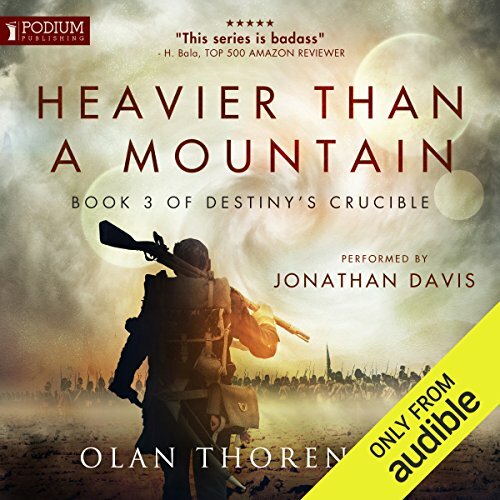 Where does Heavier Than a Mountain rank among all the audiobooks you’ve listened to so far? Too much unnecessary dialogue. Story being dragged out with no real ending forcing one to purchase the next book. Great series, keeps you wanting more! Well written and performed. Ended a bit abruptly but the next book comes out soon. Epic story that keeps getting better! This is fascinating series and very different from my usual choices. I’m very glad I decided to take a chance on the first book and try it. If you are looking for a pleasant light read, this isn’t for you right now. It’s not a simple, quick or straightforward story, but it is rewarding for those who sometimes like something a bit deeper and enjoy having to analyse and consider their own ethics and universal truths in light of danger and war. The world building is excellent, the main characters are well developed and pacing is good, for the most part. 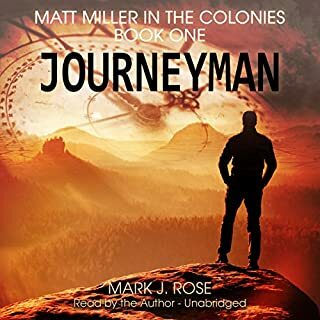 It is an intriguing mix of adventure, romance, history, science, time travel conundrums and war. It is satisfactorily well read by Jonathan Davis for all the characters , but it does not include any extra sound effects or people to ‘read’ other parts which could have made this extraordinary. Really enjoying this series of books in particular see the plot go in unexpected directions ! However I think any self respecting Chemistry Major would have invented matches after 3 books full of other chemistry inventions ?